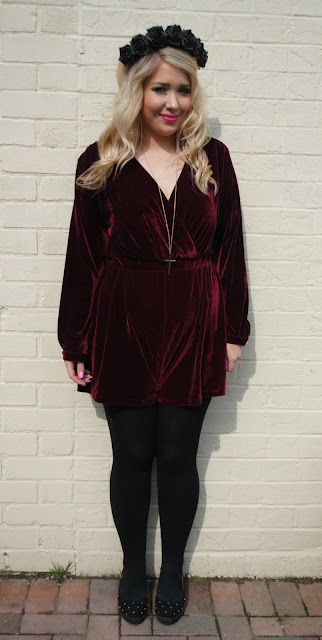 I've been meaning to blog about this stunning velvet playsuit from Lavish Alice for absolutely ages, but for one reason or another I never got around to it. Better late than never though right? The weather hasn't been the warmest lately (nice weather lasted long didn't it!?) so I decided to wear it today as it definitely deserves a bit more wear. It's a gorgeous deep wine red colour that I absolutely love and is I think it would still look fab with bare legs if things decide to turn a bit warmer. I paired it with thick tights (as it's pretty chilly out there) and my goooorgeous Primark studded flatforms, adding some rose gold jewellery to finish it off. I couldn't resist popping my Crown and Glory floral headband on too to complete the outfit. There are SO many gorgeous things on Lavish Alice right now, they seem to be heading in a bit of a new direction and I must say they get my approval! I'm completely in love with this dress, although I'd have to wear it with a vest underneath as I'm not one for showing my bra (despite how booby this outfit post may be, eep). Just had to say a massive THANK YOU to everyone who has been commenting and liking and subscribing to my YouTube channel after my recent Primark Haul went up. I'm so glad you like it! I have another haul video coming up over the weekend so I hope you all enjoy that too!